Growing up in the age of the internet has its benefits. You have an endless source of knowledge and entertainment, interacting with friends and staying in touch with them is as easy as a few clicks, and pizza can be ordered and delivered with minimal human contact. Perhaps the most glaring hindrance is that it’s impossible to lie about ANYTHING. With smart phones being in everyone’s pocket you can’t make any claim without it being tested almost immediately. Perhaps the most severely effected by this are politicians, but the only slightly less disadvantaged are the children who want to start their own summer camp with no rules, counsellors or adult supervision. This movie came out at the perfect time when technology was advanced enough to have answering machines, video tapes, and basic computers; but the zeitgeist still was to go to an encyclopedia or the newspaper for information. It is this world where Camp Nowhere resides, and it takes advantage of a time where boundless possibility is accepted with no way to verify any of it. Without spoiling the movie, Morris “Mud” Himmel doesn’t want to go to summer camp and neither do the friends in his limited social circle. Through a few fortunate accidents and with a little blackmail he is able to whip up a plan that allows him to give his parents the eight week reprieve they crave and get him out of another boring summer of heavily regimented computer camp. How do his parents keep finding these terrible camps for him to attend? Travelling salesmen with VHS tapes, brochures and a slick sales pitch of course! The absurdity of a not just one, but several men going around and knocking on doors trying to drum up bodies for a summer camp on a meagre salary and presumed commision is seems crazy to this Millenial, but having an app on your phone to pay your phone bill would probably seem crazy to anyone from this era. 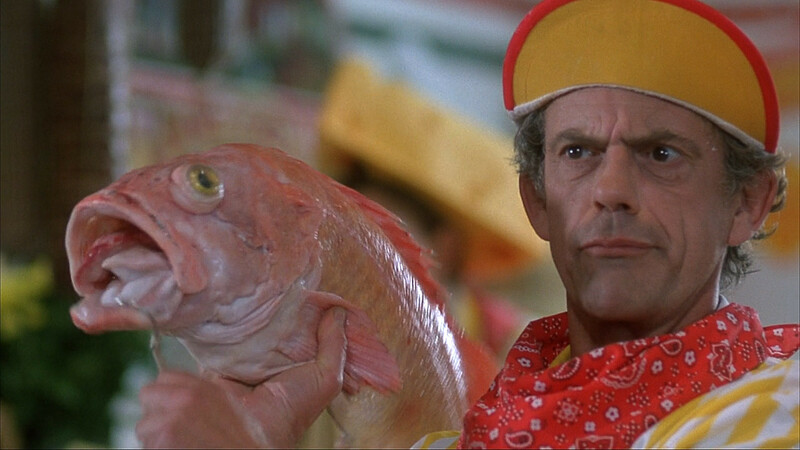 Either way, the chameleon-like Christopher Lloyd is able to play the nerdy computer camp sales person to one family just as well as the strict army camp drill seargent, the devoted artiste for a theater camp, and a Richard Simmons-esque fat camp trainer. The longer the movie goes on, the more it seems like the producers realized the only thing they had going for them was a game Lloyd willing to play dress up and get really weird. They were not far off the mark. The movie brings up an few notable themes, but the idea of responsibility and how it can be thrust on those looking to avoid it was an interesting one. Mud had tried to create the camp to get away from his parents, their rules, and the strict regiment he wants so badly to rebel against but finds himself responsible for a merry band of parent-less children trying to keep from being found out. As he descends in a spiral towards adulthood, at one point warning a camper to stop throwing things or they’ll “put someone’s eye out,” Mud learns that responsibility is something we all have to accept at some point or another. Reflecting that idea is Lloyd’s character, though he has managed to shirk responsibility for far longer than Mud could ever hope to. Constantly hopping from one pseudonym to the next, each with their own intricate and detailed back story is a delight to watch, though it’s clear to the viewer that his character is running out of rope. The juxtaposition of two characters avoiding responsibility for opposite reasons creates an interesting dynamic between the two, one sympathizing for the other and abetting the con out of an odd scoundrels code at first, then eventually friendship. The relationship is not perfectly fleshed out, and why Lloyd finds himself in such dire straits as to require the help of a precocious pre-teen. The movie is targeted towards a younger audience, and as a result a lot of potential jokes about puberty, the disparity of innocence between peers, and the insecurity of youth are glossed over. It’s understandable, and with Disney being the studio behind this flick we shouldn’t have expected a racy movie. Lloyd does his best to bring some edge with some well-timed tics filling in where a blue punchline could have been inserted but he doesn’t get much help from the script. In the end though, I can’t in good conscience recommend this movie. We had fun watching, and Christopher Lloyd is endlessly entertaining, but otherwise it was just not up to snuff.